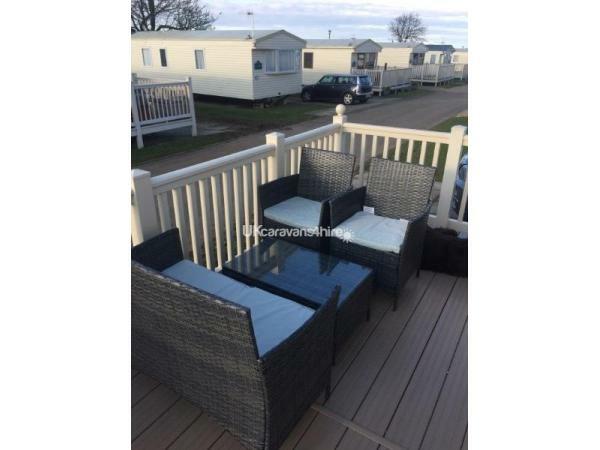 This family owned, 8 berth caravan is situated in the highly sought after area of Rose Bank, where all caravans are privately owned and there are few commuters; ideal for privacy and children alike. Rose Bank is situated in the most ideal location; far enough away from the main complex as to not be disturbed, yet close enough as to not need your hiking boots. 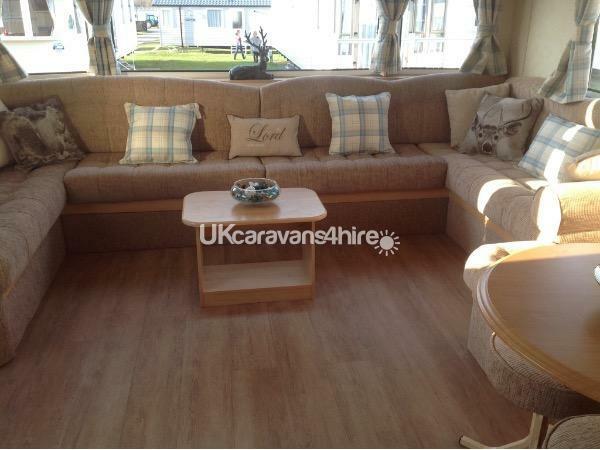 The living room is huge with plenty of room for everyone to laze around in comfort. The dining table allows a lovely centre for buffet breakfasts or drinks table. A 32 inch TV with Free-view and a DVD player can help entertain in down periods. 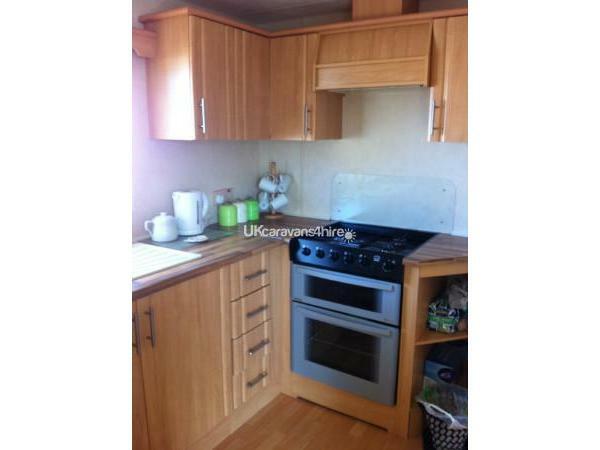 The kitchen is very spacious, modern and fully equipped with everything you need, including pots, pans, crockery, cutlery, toaster, fridge with ice box, microwave, kettle and corkscrew. There is ample storage and work surfaces. 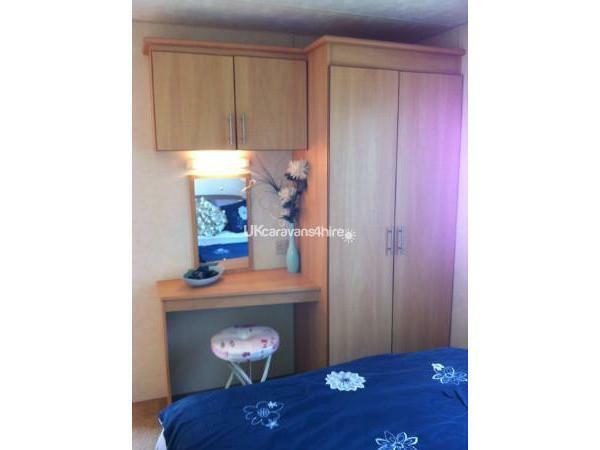 The master bedroom has a double bed, twin side tables, wardrobes, shelves, a vanity table and seat. It also has a dual light switch action, and electric heater. 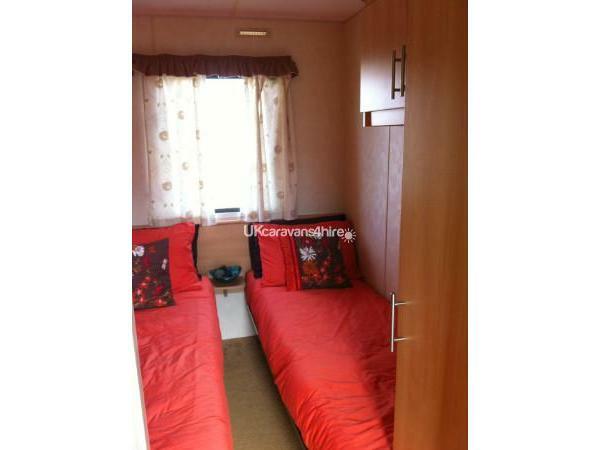 The two twin single bedrooms are tidy and functional with moveable beds, electric heaters,, wardrobes and cupboards. The living room also comprises of a pull-out double bed. The bathroom is in keeping with the rest of the caravan, functional and tidy. It comprises of a good shower, flushing toilet, wash basin and mirror. 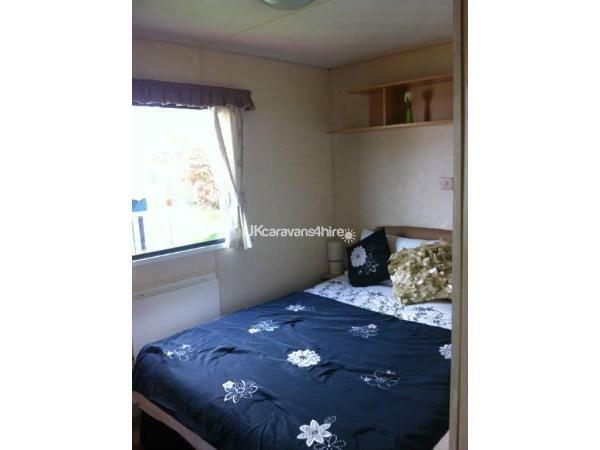 In Rose Bank the caravans are spaced very well apart, with ample room for two cars to park right outside. There is a lovely spacious veranda wrapping around with a modern rattan table and chairs giving a great space for outdoor dining or just enjoying the sun. We try to make everything as perfect as possible with as little for you to bring so we provide all the accessories that we ourselves use, including an iron and ironing board, and bed linen. And all beds will be dressed and ready for you to start enjoying your your holiday. We do welcome all members of your family, including the four legged kind. Please ask for further details. All you need to do is to turn up, relax, and enjoy your holiday. Bookings: A £100 deposit (non returnable) will secure your booking. The balance is payable 6 weeks before the holiday starts. If you book within 6 weeks of arrival holiday must be paid in full. Lettings are Saturday to Saturday, but long weekends/midweek breaks can be booked subject to availability; price on request. At Primrose Valley Holiday Park There is plenty to do on the site. 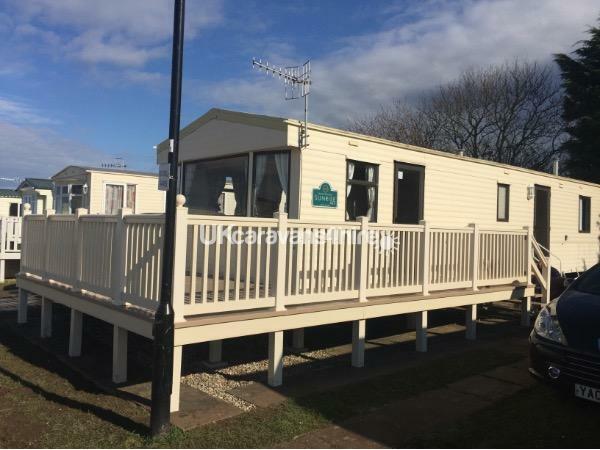 Filey is just 3 miles away by road and approximately 20 minutes stroll along the beach, which is accessible from the caravan park. In Filey there is a Tesco superstore, golf course, amusements and a whole lot more. Scarborough is not that much further down the road, where you will find a lovely shopping centre, beautiful beaches, Sea Life Centre, fair, parks, amusements, donkey rides and pubs and clubs. They are regular buses which pick up from the caravan park to take you Scarborough and Bridlington. Flamingo Land and Zoo is also a bus ride away and approximately 30 miles, which buses visit daily. Other nearby attractions include Whitby, famous for its fish and chips, Flamborough, Malton, Bempton Cliffs, Driffield, Hull, Beverley and York. Additional Info: Please Note: Access to Haven's swimming pools and show bars requires Funworks passes. These can be purchased on arrival at reception. FUNWORKS PASSES ARE NOT INCLUDED IN CARAVAN PRICE. Funworks Passes Prices (Prices set by Haven)PEAK SEASON PricesFor 7 Night Breaks£39.00 per adult (aged 15yrs+) £20.00 per child (aged 4yrs - 14yrs)For 3/4 Nights break £30.50 per adult & £15.75 per childLOW SEASON PricesFor 7 Night Breaks£26.50 per adult (aged 15yrs+) £13.75per child (aged 4yrs - 14yrs)For 3/4 Nights break £21.50 per adult & £11.25per child : On site pub, Fishing, Tennis court, Crazy golf, Restaurant, Takeaway; Grocery shop, Laundrette, Fun fair, High ropes and zip wire, Boating lake, Go karts, Climb wall, Abseiling, Trampoline, Bike and kart hire, All weather multi-sports court, Soft play area, Adventure playgrounds, Starbucks coffee shop, Mash & Barrel restaurant, Papa John's pizza takeaway (which will even deliver to your caravan) West Pier burger house, Fish & chip shop.